Has anyone thought of or made there own foil wings. I was thinking of making one as a winter project starting with the front wing as the back wing( rear stabilizer) seems less crutial for earlier flight in light wind? My current foil is the 2018 AL bluey, front wing span 72cm. I am wondering if my fuseledge would work with a bigger wing say up to 85cm without bending. I am considering wood(glassed over) or aluminum. This idea came to me as I was having trouble to get enough lift in light wind with bigger sails (9.9m).A longer fuseledge would be great as well for y big sails but way more technical to make and i frankly don't have a milling machine laying around. I also think a bigger front wing would help in light wind in general with smaller sails say my 7.5m and give better stability as well. Carbon seems too expensive and delicate to use and make. So many different shapes out there don't even know where to start. What do you guys think? Rig your 7.5 with minimal downhaul and loosen outhaul until the sail hits 40" of the inside boom arm. Then pump like heck and you still need 12 mph gust to get up. I've made a couple of front wings using 1/8'' fiberglass wrapped in carbon fiber. It's not as expensive as you might think. They got my N.P. going much better in lighter wind. Your 72cm wing span seems pretty good size, though I haven't heard of that brand. AL bluey ? The lighter air wings have a lot of width & more concave on the bottom, almost lake an airplane w/ the flaps extended. Your rear stabilizer should be fine as is. Its a neil pryde rs:one aluminum foil 2018 model is blue. Has anyone ever thought of making a foil wing similar to a sailboat foil. Moths have a very good overall average speed. While the foils were intended to decrease drag and give them a very good average speed. The goal was not to reach max high speeds like gps windsurfers. This picture is a high aspect foil used by many of the top sailors in the 2017 moth worlds. Looks to be 108cm by 9.96cm( Moths have 2 foils, one in the front and back). much wider and maybe a little narrower then the 80cm race ones neilpryde has today. I Know moths are not the same as a windfoil setup but probebly the closest thing to a windfoil weight to size ratio, so I thought I would throw this out there. I would think pryde and many other foiling brands tested different foil wings like this one before they decided which shape to use?? Very interesting thread on foil designs here. The two earliest planing to solidly foil guys around here, out of 8 racers and two rec Slingshot guys use kitefoils on their 90 cm course Tillos. They've tried lots of combinations, but the short fuselage 72cm high aspect wing have the least drag and most response to pump onto the foil in less than 13mph gusts using sails around 6 meters. It can't be fun foiling around being the slowest sailor in the water. A big front wing is slow, slow, slow. I am a windfoiler in light winds 80% of the time below 12 knot days. I like how horue and others like pryde are starting to sell wings that mount to older fusledges. But wish pryde would make a wing a little bigger like something in the 80 to 90cm range for me. The 2019 aluminum wing is only 1cm longer then mine at 73cm in span. But it has curved wings which supposidly helps. Horue has some top notch foil gear( do not own any) but did see this on there site showing the three different foil wings. "The Cruising frontwing is ideal in winds above 18 knots windfoil, and is 100% compatible with kitefoil use from less than 8kts. This wing is designed using CAD with a profile specially designed for hydrofoil use, it is proudly made in France, using 100% carbon in a CNC machined mold. The Horue lightwind wing is intended to be mounted on the foil Horue GP for use in a 8-25 kts wind range, with the same stabilizer. speeds, allowing very long glides even when the wind drops. The overall shape has allowed us to obtain a forward center of thrust for a very early planing. The elliptical lift distribution ensures minimum induced drag. 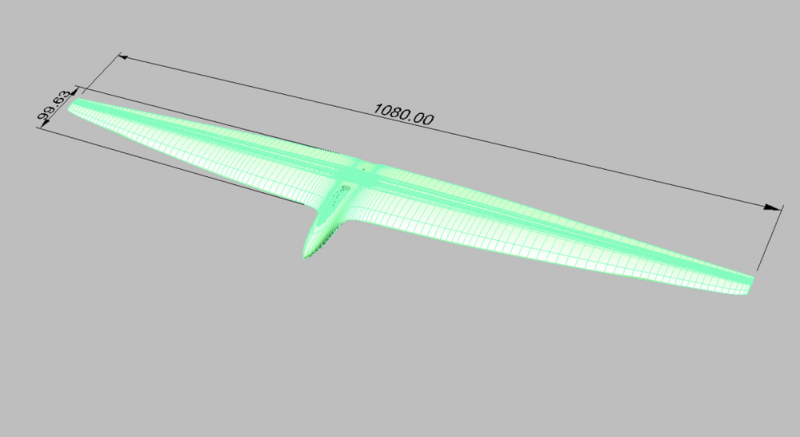 Developed from the lightwind wing drawn by our engineers, it uses all the lightwind wing advantages, but with a larger area. The progressive profile retained on this model allows the wing to adapt to the different Reynolds numbers encountered throughout the span of the wing. The result is an increased aerodynamic finesse, which provides more powerful lift that will allow heavier riders to flyi under 8 knots. For this model with an impressive wingspan, we especially worked on the flex in order to "pump" on the wing for even faster planing. The wing is ideal for 8 knots wind and heavy riders in windfoil. This wing is designed in CAD with a special hydrofoil profile, it is proudly made in France, using 100% carbon in a CNC machined mold. windfoil use only in 6-knots"